We present a one-man-show of his works at the gallery, our last show was 20 years ago. We met Susi Magnelli through Jean Dewasne, she was a great defender of her husband’s work and an interesting source of informations. A small presentation of his works took place at the Pompidou Centre, following a donation of his African collection in 1995 by Madame Magnelli, since then there was no other show of Magnelli’s work in Paris. With our modest possibilities we try to repair this error. We will present works from 1924 to 1965 among them paintings, gouaches, paper-works and slates. 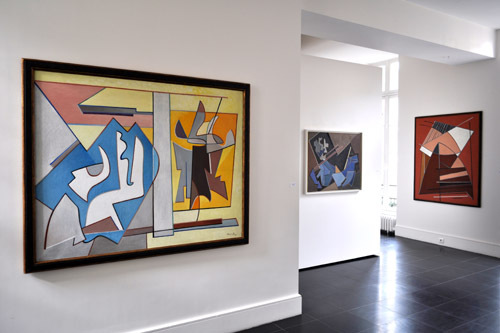 It was in the autumn of 1947 that a retrospective exhibition at the René Drouin Gallery in Paris focused critical attention on the work of Alberto Magnelli. The show constituted an aesthetic revelation that provoked an almost unanimous jolt of enthusiasm among the public, even thought it came rather late, considering that the fifty-nine year-old Florentine painter had already been working in France for fifteen years. Magnelli’s pioneering role in the elaboration of abstract art was well known, yet only with this show did he earn recognition as a contemporary and topical painter. 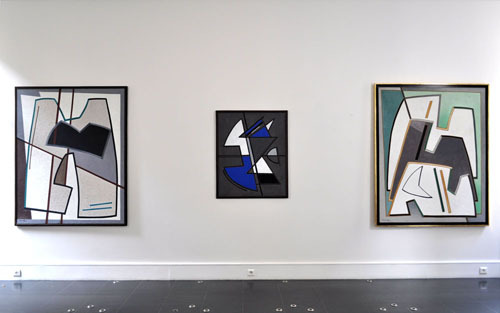 He became a leading figure for a new generation of post-war artists who adopted geometric abstraction as a reaction against the trend toward lyrical, unstructured painting.